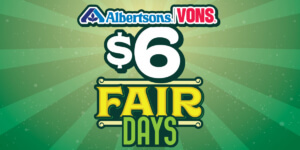 Albertsons|Vons $6 Fair Days are Friday, May 31; Saturday, June 1; and Wednesday, June 5. You can enjoy a full day at the Fair for just $6, but only with tickets available at Albertsons and Vons stores. These tickets are not available at the Fairgrounds.You can get them only at Albertsons or Vons, with a $10 minimum purchase. The tickets will be available sometime in May; we’ll let you know when.